Serious. I know I make mistakes. No doubt some stupid and some out of pure ignorance. Yes there is a difference . BUT Never ever would I do some of the stupid crap I am seeing posted on FB help sites. Sorry this really pissed me off this morning. Abject stupidity and selfishness. These are the two primary reasons I rarely visit my FB. Yeah, I set one up because so many friends are connected, but cannot bear to sift through so much banality and occasional idiocy. That said, there are MANY responsible FBers, and sometimes I feel guilty for not making more appearances. I hope that dumb lummox promptly re-homed her poor bird. Love that image you posted. 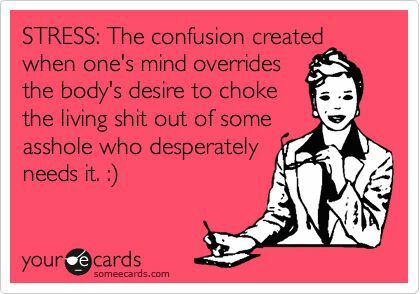 I've got a stronger one, the quintessential definition of STRESS! However, it is NSFW nor appropriate for overt posting in a family forum, therefore a link for those interested! Mods, feel free to delete if the posting of the link is verbotten! Last edited by Scott; 01-29-2016 at 09:33 AM.